Luton were held to a goalless draw at Plymouth this afternoon after coming up against an inspired display from former loanee keeper Matt Macey. The Arsenal stopper was in excellent form, particularly after the break, as he denied Town the three points that they deserved for their efforts in those second 45 minutes. Try, try and try as they might, the visitors just couldn't break through a resilient Pilgrims' back-line, although the result did see Luton extend their unbeaten run in the Football League to 23 games. Boss Mick Harford named an unchanged side, the hosts threatening first, winning the ball back from a free kick deep inside Town territory, Ruben Lameiras's angled drive not missing the target by much. Hatters had their first serious attempt on 10 minutes, when Matty Pearson picked out the advancing James Collins, who headed back for Andrew Shinnie to ambitiously volley over the bar from 30 yards. Town started growing into the contest, Pelly-Ruddock Mpanzu's effort from just outside the box was simple for Macey, the ex-Hatter not tested when Elliot Lee had a pop from a long range free kick. Luton created their best opportunity on 20 minutes, as a glorious passing move saw Mpanzu escape on the right, his cross met by Lee from close range with Ryan Edwards blocking on the line and Collins slicing the rebound well wide. 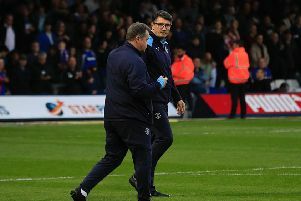 The Hatters were were forced into a reshuffle just after the half hour, as Hylton, booed at every turn, was involved in a nothing incident with Yann Songo'o five minutes previously, shown yellow by referee Darren Drysdale, who appeared desperate to get the home fans on side. Just moments later, Town's striker went over expecting a free kick which wasn't given, grabbing the ball in frustration, with Drysdale calling him and captain Bradley over for a word. It was abundantly clear he was on his last warning, meaning Harford had no option but to take the forward off before he saw a third red card of the season, Kazenga LuaLua on in his place. After the break, Bradley was somehow left all unmarked at the back post by his old team-mates to chest James Justin's corner down, beat his man and find Collins, his effort repelled. Argyle pressed too sporadically, Joe Riley picking out Lameiras, who forced James Shea into a sprawling save from the edge of the box. Collins dragged wide, before the attacker thought he had broken the deadlock, meeting LuaLua's cross with a well directed header, only for Macey to use all of his 6ft7 frame to stick out a hand, tipping on to the bar and behind. Macey was called into action again just before the hour, parrying Lee's blast away and then claiming the corner well. The game started to really open up, Lameiras finding some space in the area, unable to find the bottom corner. Luton kept pressing, with the overworked Macey doing well to get down low and flick Lee's low effort away after Mpanzu's incisive run and cross. Argyle had the odd threat, sub Ryan Taylor spinning and shooting waywardly after the ball dropped to him. Dan Potts replaced Justin, as Harford opted against calling for either George Moncur, Jason Cummings or Luke Berry, and his low cross was grabbed at full stretch by the inspired Macey, with Mpanzu then slamming a hopeful attempt into the stands. Although forcing a number of decent positions and winning plenty of corners in the final stages, Luton just couldn't get that all-important goal, as they saw their lead at the top cut to three points with Barnsley's win over Accrington. However, they remained seven in front of Sunderland, the Black Cats pinching a point at Wycombe courtesy of a stoppage time equaliser. Argyle: Matt Macey, Joe Riley, Gary Sawyer ©, Yann Songo'o, Ryan Edwards, David Fox, Graham Carey, Ruben Lameiras (Paul Anderson 90), Niall Canavan, Freddie Ladapo (Ryan Taylor 67), Oscar Threlkeld (Jamie Ness 67). Subs not used: Ashley Smith-Brown, Scott Wootton, Alex Fletcher, Michael Cooper. Hatters: James Shea, Jack Stacey, James Justin (Dan Potts 80), Matty Pearson, Sonny Bradley (C), Alan McCormack, Pelly-Ruddock Mpanzu, Andrew Shinnie, Elliot Lee, James Collins, Kazenga, Danny Hylton (Kazenga LuaLua 35). Subs not used: Harry Isted, Jason Cummings, Alan Sheehan, George Moncur, Luke Berry. Booked: Carey 29, Hylton 30, Edwards 42, Canavan 62, Shinnie 74.